The Swift Green SGF-BO90 Refrigerator Filter is made of eco-friendly coconut shell carbon block media and is is designed to fit into Bosch/Thermador KAD62, KA62, and K59 American-style fridge-freezers. These cartridges are easy to change and replace with their quick change design. They are built to last and can withstand thousands of water pressure cycles. Swift Green Filters are the only aftermarket refrigerator water filter to receive the WQA Gold Seal of Approval for the high quality components and manufacturing processes. SGF-BO90 reduces chlorine, taste, odor, sediment, dirt, rust, and VOCs. 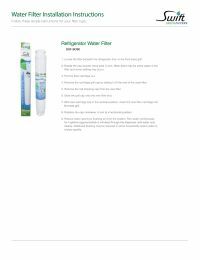 Swift Green SGF-BO90 refrigerator filters should be changed once every six months and have a capacity of 300 gallons. The WQA has certified this cartridge to NSF Standard 42.